It was a full day last Monday. Inside and outside cloudy and grey. I remember I had an appointment later in the day than usual with my therapist and I had to call my husband on the way home. I would need him to take care of the kids and run interference for me because I had EMDR therapy. (You can find out more about that type of therapy here.) So I would need to lie down when I got home and try to go to sleep. I have therapy for PTSD due to childhood sexual abuse. I had a hard session that day, but I had prayed to the Lord right before I went in that I opened my heart to Him for Him to have His way. For some reason I could not seem to rest. I tried as hard as I could to fall asleep but I couldn’t. I also couldn’t shed a tear. I had in the therapist’s office a bit, but could not cry now. My stomach was in knots but the emotion was just stuck there in the pit of my stomach going nowhere. So after about an hour of no ability to fall asleep I got up and joined my family. I still allowed my husband to do everything for us and waited for the night to come to an end when I could take my sleeping pills and get some Zz’s. That was essential for my brain to finish processing out what had happened during therapy earlier in the day. So when all was quiet I took my medication and lied down expecting to fall asleep because I was so tired, but suddenly I couldn’t breathe, then my chest got tight, then the tears began to fall but I couldn’t cry out. A panic attack hit me like a ton of bricks. The walls were tumbling down. I should have known. I have had many before after this therapy I have been having for years now. I finally caught a breath and then sat up in the bed and took my anxiety medication. Suddenly I was sobbing tears like fountains. The emotions that were once in the pit of my stomach were now flowing freely through my tear ducts. And I remembered the verses we had been working on over the last few weeks and the song that was playing on the radio on the way to the therapists office. “Your love never fails, it never gives up, it never gives up on me.” And I clutched my Bible and I cried the ugly cry until the last tear was shed. It reminds me of how much we really are born anew like when a mother first sees her newborn child all messy and blood covered yet she kisses them anyway because the love is so great she can’t deny it. Beloved we are so loved and so clean in Christ. This week let’s choose to remember and use this to battle fear. 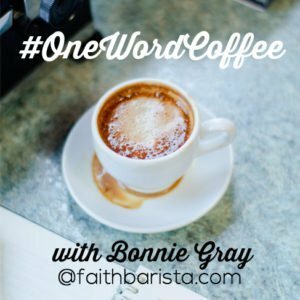 I link up weekly with my friends over at Faithbarista.com and One Word Coffee and Holley Gerth Coffee for Your Heart just click below for another cup of faith. I have a friend going through the same type of therapy. You are so right, when we are diving into those deep places to chase after the freedom we know Christ has for us, we must hold to His truths! Thank you for sharing your words! Visiting from Coffee for the Heart.